Hey, i had a brand new GH50L that i was forced to sell, but let me tell you if u can, pick up a GH50l or 100. The 50l is so loud in my friends band who now owns it, on 3.5 - 4 , he is drowning out a reworked blue voodoo that is up on 6 ...... while he is using a attenuator !!! They are loud and so beautiful sounding, the footswitch adds gain so it will not go to clean unless you dial the gain/boost all the way back. However you get a beautifully clean sparkling tone by rolling you're vol. back on you're guitar while having the gain and boost up. They really do sound like what u hear on get out of my yard... as long as paul lets u borrow his hands. the sound was much, much better. I also tried it with a THD hotplate with pretty good results because ive been drowning out the drummer with the amp on 1.5.
sounded great with the valves actually having to make an effort ! Thinking about selling my Laney GH50L. For $500. It's kind of old, but still works fine. Might need new tubes but that's it. What do you guys think? Good price? yeah? no? $500 seems a bit steep to me, what's the condition? Very average. The black cover is ripped a bit on a part of the amp. I don't want to go below $400, cause the amp goes for quite a bit already. I made a new thread about it so that people will look at it more. bean, I dont know mate, I thought that the gh50 was about $700 new ? Well I'm changing it from 400-500. Yeah, the GH50L go for about 700+ here. Thanks for your guys's inputs. . Although I don't want to rip someone off, I am still trying to make as much as I can. Selling my Laney GH50L with a foot switch included. 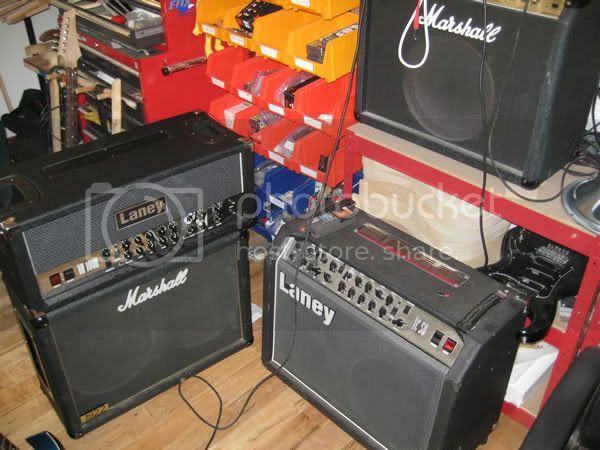 It's a decent going price, I've seen used Laney's range from $450-550. Mine's going for $450. Anyone living in the bay area interested? Please help me guys I feel so stupid atm cuz I just got a new amp and can't enjoy it:(. with the amp turned on and the valves exposed so you can see the glass, tap the valves with a pencil (lightly) this should not be heard through the speakers but if you can hear a noise through the speakers then the valves that are generating that noise are knackered. I would do this test of all the valves, the pre-amp valves will likely be the culprits and when you find the problem change them all rather than just the ones that are microphonic. I have JJ's in mine and they are great all round tubes. I tried one of the 30 W tube combos ( I forgot their name) and I kindda liked it. Are they as good as the GH50Ls? My vc15's tone knob just became faulty. I have just bought my first tube amp! but does anyone know how to use the standby switch and what it's for? I have a gh50l and i think the pre-amp tube are broked, has anyone re-tubed there GH50L, what are the best tubes? i may get some new El34's while im at it, ive heard of J'J's or something being good, anyone one with experience? and out of interest has anyone run theres with 6l6's? whats it sound like? You turn the amp on, but leave the Standby switch off for a few minutes. it lets the amp warm up so the tubes dont get a shock from being cold to hot quickly. Helps the tubes last longer. I retubed my GH50L and went from stock to high-gain JJ EL34s (the have a kit you can buy). I can tell the different in tone. The new tubes are a little smoother and fatter sounding. I also bought a weber mass from eurotubes. Weber mass + the new tubes made me love my amp.